Barbarian Days is by William Finnegan, not David I. Kertzer. I wouldn’t be such a stickler, but I read excerpts of that book in The New Yorker and the writing is phenomenal. Also, it’s on the front of the book image, just below the lists. Also, it was the winner, so proof-reading is a must before publishing. It truly is, Steven. Thanks for the alert. We’ve fixed. I love that Lydia Kiesling is now replying to line edits. Long live the Queen. Hurray for The Sympathizer! I love that novel!! Mostly just happy that hack Coates didn’t win another award. Congrats to Stiles on a second history Pulitzer. Whatever one thinks about awards and whether or not they’re overrated or how truly “earned” they are, that’s a friggin’ helluvan achievement. I must admit I am more likely to check out The Sympathizer. I just hope it’s not some by-the-numbers refugee fable or immigrant story. Seems like it could be a Vietnamese version of Wiley’s Pen-Faulkner-winning Soldiers in Hiding. Interesting that it’s set in the mid-70s, that slice of history seems so recurrent right now on this side of the Pacific whether in Vinyl or City on Fire or in a lot of the indie rock bands seemingly to retrench themselves in an edgy 1970s rock vibe. I’m not loving Nguyen’s collectivism in interviews and excerpts (all that “on the shoulders of giants” rigmarole about how this wouldn’t have been possible without the trailblazers yada yada yada) but I guess I’ll have to read the man’s novel for myself to determine whether the Pulitzer they gave him is tokenism, awarding legitimate literature, some combination of the two or something else entirely. 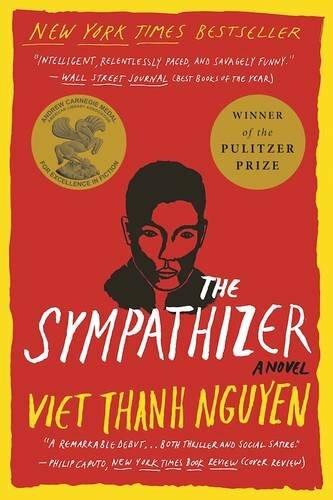 It’s certainly been shortlisted or the winner of a boatload of awards now, with the Pulitzer as the capper, now granting Nguyen lifetime membership in the contemporary canon. Hopefully the work merits such inclusion and he doesn’t become some overly politicized yawn-inducer like Junot Diaz or Edwidge Dandicat. This year’s Pulitzer winner for fiction has gone to a book from Bellevue Literary Press, an “unlikely” operation that runs out of Bellevue, the famous New York psych hospital (the New York Times wrote up the press in 2007). Rounding out the fiction finalists is an effort from another small press, the venerable Soft Skull, and a much praised short story collection .Here are this year’s Pulitzer winners and finalists with excerpts where available:FictionWinner: Tinkers by Paul Harding – (excerpt)Love in Infant Monkeys by Lydia Millet (Lydia Millet participates in our Year in Reading)In Other Rooms, Other Wonders by Daniyal Mueenuddin (a Year in Reading selection)General Nonfiction:Winner: The Dead Hand: The Untold Story of the Cold War Arms Race and Its Dangerous Legacy by David Hoffman (excerpt)How Markets Fail: The Logic of Economic Calamities by John CassidyThe Evolution of God by Robert Wright (excerpt)History:Winner: Lords of Finance: The Bankers Who Broke the World by Liaquat Ahamed (excerpt)Fordlandia: The Rise and Fall of Henry Ford’s Forgotten Jungle City by Greg Grandin – (excerpt)Empire of Liberty: A History of the Early Republic, 1789-1815 by Gordon S. Wood (excerpt)Biography:Winner: The First Tycoon: The Epic Life of Cornelius Vanderbilt by T.J. Stiles (excerpt)Cheever: A Life by Blake Bailey (excerpt)Woodrow Wilson: A Biography by John Milton Cooper, Jr. – excerptWinners and finalists in other categories are available at the Pulitzer Web site.